Royal Caribbean's Splendour of the Seas is currently in dry dock at Cadiz having a number of new features installed. 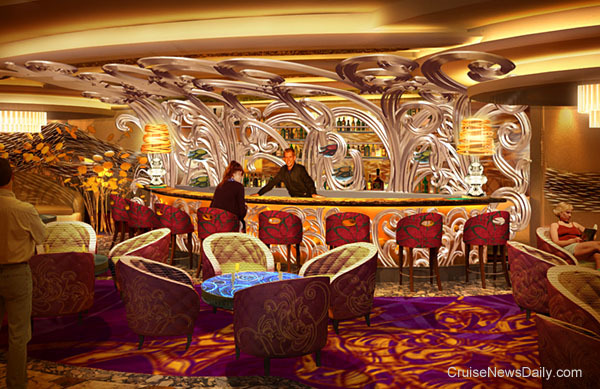 During the process, the ship's atrium will undergo a visual transformation, and its centerpiece will replace the current Champagne Bar. The new bar will be called the R Bar. The new bar will have "a sophisticated 1960's vibe." The rest of the atrium will also be getting a makeover with the latest in sound and light technology, but its most unique feature will be new equipment being installed above the heads of the passengers in the 60-foot Centrum. It will be used for the ship's "vertical entertainment," aerial acrobatic vignettes several times a week which blur "the lines between artful choreography and state-of-the-art technology." Splendour returns to service with its new features in place on November 26, 2011. The competition will culminate with a special eastern Caribbean cruise aboard Ruby Princess on April 8, 2012, when the five finalists will be showcased, and passengers will vote for the line's 2011 Entertainer of the Year. Dreamworks Animation pulled out all the stops for the debut of Puss in Boots aboard Allure of the Seas. Of course the premier was a red carpet event, complete with the shows stars which included Antonio Banderas and Salma Hayek.